Le réacteur était à 100 % de sa puissance quand le signal est apparu. L’arrêt se serait effectué correctement avec une alimentation électrique réalisée par les lignes extérieures. Mise à jour du 6 novembre 2017 : le niveau bas dans le générateur de vapeur est la conséquence de la tombée de la turbine qui en fait a été le premier problème du réacteur. "On November 3rd, 2017 at 2022 EDT, the Indian Point Unit 3 Reactor Protection system automatically actuated at 100 percent power. Annunciator first out indication was from 33 SG [Steam Generator] Low Level. This automatic reactor trip is reportable to the NRC under 10 CFR 50.72(b)(2)(iv)(B). All control rods fully inserted on the reactor trip. All safety systems responded as expected. The Auxiliary Feedwater System actuated as expected. Offsite power and plant electrical lineups are normal. All plant equipment responded normally to the unit trip. No primary or secondary code safeties lifted during the trip. "The Auxiliary Feedwater System actuated following the automatic trip as expected. This is reportable under 10 CFR 50.72(b)(3)(iv)(A). The Emergency Diesel Generators did not start as offsite power remained available and stable. The Unit remains on offsite power and all electrical loads are stable. 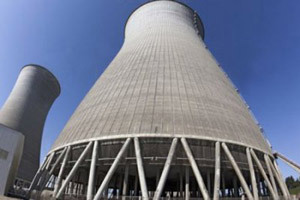 Unit 3 is in Hot Standby at normal operating temperature and pressure with decay heat removal using auxiliary feedwater to the steam generators and normal heat removal through the condenser via the high pressure steam dumps. Unit 2 was unaffected and remains at 100 percent power. "A post trip investigation is in progress." The licensee indicated that Radiation Monitor number 14 spiked twice during the transient, however, is currently not indicating any signs of radiation. The licensee will notify the NRC Resident Inspector and the NY Public Service Commission.